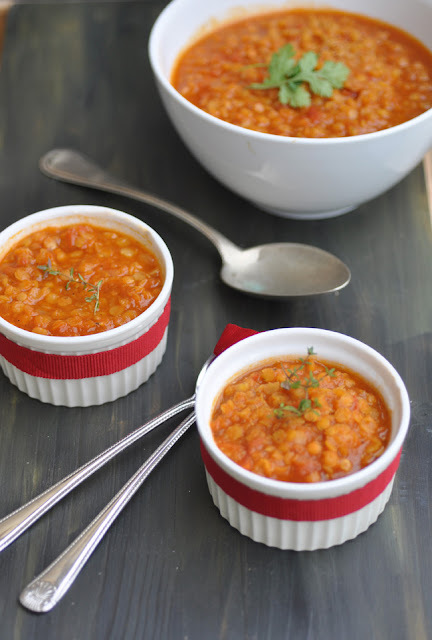 I come straight to the point: this red lentil tomato soup is my absolute favorite soup. I could eat it everyday. Because some other family members may find that a little too often, I only dish it up once per week. As some of you may know, we live in the Middle East, which has a tradition of using any sort of beans and lentils in the most delicious dishes. I had pure lentil soup ( a traditional Lebanese dish), which I love, but when I came across my first red lentil tomato soup, I forgot everything else. What really works for me in this soup is the fact that the fruity fresh tomatoes lighten up the heavy lentils. Vice versa, the lentils make this dish a hearty long-lasting meal, whereas after a pure tomato soup I get hungry again two hours later. Apart from the tomatoes and lentils, the most important ingredients are the spices: I got Indian home-made garam masala powder here, which already includes 40 something different types of chili, I was told. I believe that store-bought is not as hot. That's why I added some optional ground chilli powder to the recipe. This soup needs to be spicy. The final touches can be done in the serving bowl. Yogurt is a good and low-fat alternative to heavy cream to make the soup a little smoother. Coconut milk or cream gives this soup an extra tweak that sweetly softens the otherwise spicy soup. At the same time it's not an overbearing flavor in the soup, rather works in the background. If you rather spice up your soup even more and into another direction, put sumac on. The sumac plant grows in the Mediterranean countries and the Middle east. Its dark red berries are ground and used as spices. It's got tart, tangy, salty and bitter at the same time. In the Middle East it is often used in salads on breads and for meat marinades. Sprinkled over the tomato and lentil soup it gives the chilli-based spiciness more depth. Heat the olive oil in a deep pan over medium heat. Fry the onions until softened and lightly brown, about 5 minutes. Add celery and garlic. Cook for another 2-3 minutes. Stir in garam masala and chili and cook for another 1-2 minutes. Now add the chopped tomatoes, vegetables stock and bring to a boil. Season with salt and let simmer for about 20 minutes. Let cool. Puree the tomato soup, then put back in the soup pot. Now add the red lentils. Cook the lentils in the tomato soup for about 15 minutes, or until tender, but not mushy. Season with sumac. Stir in coconut milk. Ready to serve.